The chain rules are normals -> Specials -> EXs/supers. 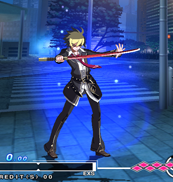 You can chain normals in any order for more combo and pressure options. Example 5C->2B->5A. You cannot block ground normals in the air. C specials are EX specials and cost super meter called EXS. EX specials cost 100 which means half of the gauge. Supers cost 200, a full gauge. Besides the usual normals and command normals, each character also has unique dashing normals- 66B, 66C, or simply B or C while running. You can also charge some moves by holding the button and get additional properties. A+D= Throw and throw escape. 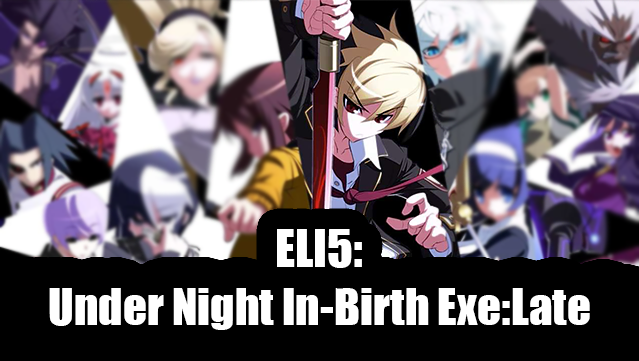 Mashing 5A will perform an Auto combo that ends with an EX move if you have meter. You cannot die from chip damage. Counter: Better combos. 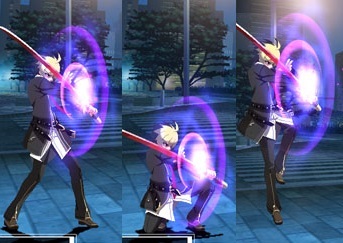 Happens when you hit the opponent out of startup recovery frames of normals. Hitting the opponent with A normals cannot generate a counter state. Performs a small hop forward. Can be used in the air as a forward airdash, or on the ground. 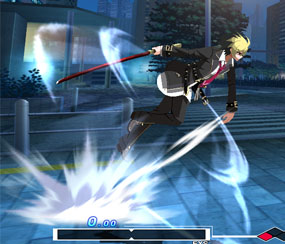 The ground version does not allow you to cancel the attack used, so overheads done early during a hop will not grant a full combo. You cannot block nor use Shield during the Assault. 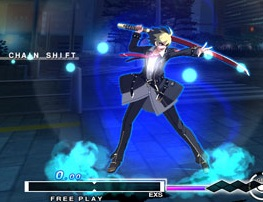 A seesaw bar that rewards offense play, and using Assault, but also fills by blocking successfully. A 17 second timer that appears as a circle on the GRD gauge. 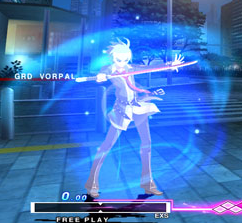 Whoever has more GRD blocks than the opponent when the timer finishes rotating enters Vorpal and gains a blue aura. Provides a cheaper alternative to the big cost to the alpha counter. Most importantly, the ability to convert the Vorpal state into Chain Shift. The best move in the game and the main reason you fight hard to gain the Vorpal. It’s invincible from the 1st frame, pauses the game and allows you to react to what’s happening and shove a reversal in case the opponent pressed a button. 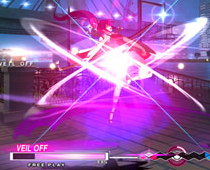 It can also cancel your moves a-la Roman Cancel which is always useful for combos and safety. It also converts your remaining GRD blocks into super meter. 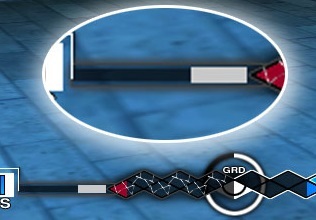 If the GRD gauge breaks, you don’t lose your existing blocks but you lose the ability to gain new ones, and can’t use the various D button actions for a short period of time. An extra normal which has different uses for each character. You can use it while you GRD gauge is empty, but if it’s not empty it will remove one block, so use it sparingly. An advanced blocking with extra risk and extra reward. Provides faster recovery and upon successful blocking gives you GRD while removing from the opponent. The risk is that if for example you shield high and you got hit low or got thrown, your GRD gauge breaks for a limited time. Shield also costs a tiny little of super while being held. 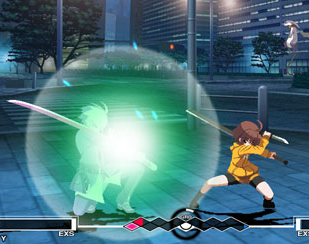 You can also shield while airborne, which will work against air moves but not against ground moves. Wastes 10 points of super for every hit but pushes the opponent away from you. If penetrated like in the scenario mentioned above, you lose 1 GRD block. Manually charges GRD while reducing the opponent’s GRD, and costs a tiny bit of super. Leaves you vulnerable so usually you will not find an opportunity to do this. A costly Alpha Counter. If used when it Vorpal state, it ends the Vorpal state. If used while not in Vorpal state, it requires at least 100 super, uses all the super you have and breaks your GRD gauge. If you have at least 100 super meter you can use this during neutral. The invincible explosion can knock opponents away and breaks their GRD gauge. This is useful to escape pressure or to extend specific combos. Afterwards you enter a timed state where you can use EX moves freely, and get bonus 20% damage and GRD gain, until the super meter depletes. Be careful as it can be baited, blocked and punished. An improved version of your super which can only be used when your life is below 30%, empties your GRD hage and breaks it, so it’s ideal as a finishing move. As with all invincible reversals it can be used right after Chain Shift to confirm a raw hit.